Are you a dog owner who’s found themselves googling basic dog first aid? Have you ever questioned whether or not your dog needs to go to the vet? If you are anything like me, then in just the three years that Millie has been in my life, we’ve had a few trips to the vets. From sickness and split paw pads to an emergency vet appointments due to ‘hobbling’, we’ve had our fair share of mishaps. So it’s no surprise that attending a dog first aid course has never been far from my mind. Why? Well, each and every time I’ve ‘ended up at the vet’s, or found myself hunting for that first aid kit, I’ve both wondered if I knew enough. Whether that be following a serious accident or injury or just applying basic first aid. In some ways, setting up Millie’s Pet Services has been the perfect excuse for me to sign up to a dog first aid course. If you’ve read our ‘Hiring a Dog Walker’ blog and checklist you’ll know that I recommend asking all dog walkers whether they are first aid trained. I’m personally committed to ensuring that we provide high levels of care that anyone involved in providing animal care as part of Millie’s Pet Services will have attended a dog first aid course as part of their mandatory training. So this weekend, I took 7 hours out of my Sunday to attend a face to face course offered by Alder Holly. I had been signposted to them by Carnoustie Canine Capers as I was keen to undertake training face to face in the local area. So after a short 20-minute drive up to Forfar, I arrived at the venue ready to learn. So let’s dive into what exactly is dog first aid and my top 5 reasons why should you attend a dog first aid course. What is Canine First Aid? A dog first aid course should provide you with the skills to treat a dog who has been injured at the scene of the incident. This is to allow you time to get to more specialist care (i.e a Veterinary Practice). The typical content of a canine first aid would include prevention measures, weekly health checks, and vital sign checks. It should also include how to treat a dog in an emergency. From basic first aid through to the application of CPR. The courses tend to last a full day though online versions can be found and undertaken at your own pace and time. It should be noted that attendance at a dog first aid course is not mandatory for any dog walker. You should therefore not assume all dog walkers have been trained. Also, while a certificate is provided to confirm attendance and awareness, it is not a formal qualification. It is generally viewed as best practice to update your skills by re-attending every three years. However, many providers recommend that you attend a shorter CPR and choking update on an annual basis. Why Should You Attend a Dog First Aid Course? While I attended the course as a professional dog walker and pet services provider, there was a great mix of people in the room. Course attendees ranged from dog trainers and groomers to dog owners who did not work in the pet industry. The course content itself is geared to all dog owners or those who care for dogs, whether that be 1 or more at any point in time. It’s clear that whether you have a career based around animal care or provide services involving dogs, many see that the course will benefit them as well as general dog owners too. For the full day session, I paid £49, which I feel is more than reasonable for both the content and length of the course. This included tea and coffee along with a little handbook which you could add to your canine first aid kit. There were 8 of us in attendance and thus great for real practical hands-on training. There was even several dog dummies provided to practice on. Researching in advance I found courses ranging in price from £45 to £120. There was also a mix of face to face and online courses available. Even at the upper-end price bracket, £120 is great value for this length of a course and you’d be hard pushed to find courses packed with so much practical information at this price. Now I think we can all agree, that it’s highly unlikely that an injury or incident will conveniently happen just outside of your own Veterinary Practice. More often than not, a dog injury will happen whilst out on a walk, away from home. It’s also common for owners to spot something unusual once you’ve returned home. The first few seconds after an accident can make a huge difference and the difference between life and death. 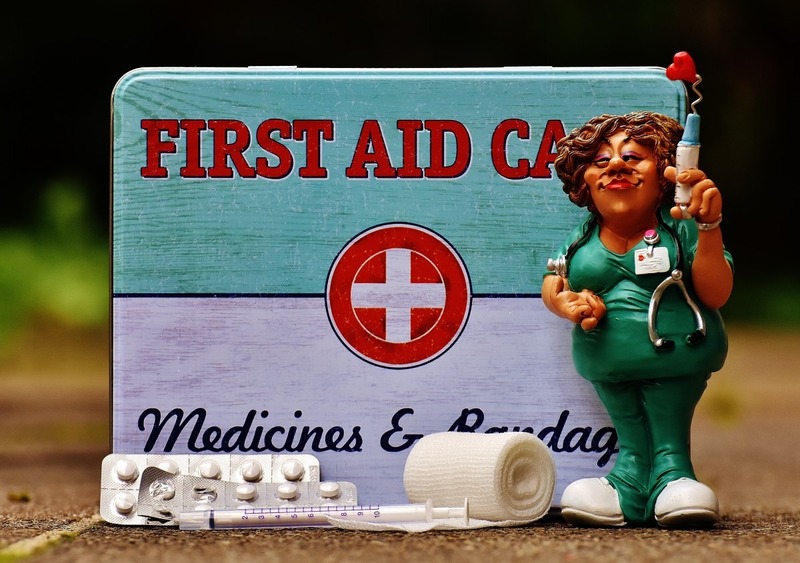 So, irrespective of where you live and accessibility to your Veterinary Practice, it’s a good idea knowing how to provide temporary first aid while you obtain professional help. Caring for a dog, whether as an owner or professional brings a great deal of responsibility. Knowing what to do should an accident happen is essential. The last welfare need of the act enforces this point by clearly stating we should take all reasonable steps to ensure that any animal, including dogs, are protected from pain, suffering, injury and disease. The skills you learn during a dog first aid course will help you fulfill that welfare need. During the dog first aid course, I was sat with a lady who had owned her own dog walking business. During her 7 years of trading had no need to use any of the techniques we learned during the course. On the other hand, our course instructor and another attendee were able to share 2 examples each. In those examples, they had to practice the methods we learned during the course on their own dogs. This clearly contributed to ‘saving’ the dog from life-threatening injuries. But what if? Wouldn’t you hate to think that if the worst was to happen that learning some basic techniques may have saved your dog’s life or the life of a dog in your care? My worst nightmare is to be in a situation in which I would find myself saying “if only I’d known how to do …. “. For me, attending a dog first aid course was a no-brainer and I know now that with some follow-up practice, I will be able to do everything I can to protect and care for a dog who is in my own care. Those few basic skills really do make a difference to your peace of mind and will increase your confidence. Ready to book a Dog First Aid Course? 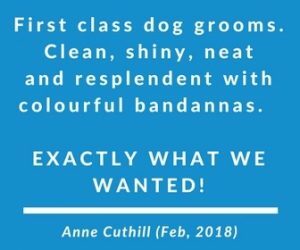 So if you are looking to increase confidence with caring for your dog and have a fun and informative day, then I could only encourage you to give it a try. Over the next few days, I’ll be sharing some of the key learnings from the course to help you as a dog owner. This will include what to have in your first aid kit. I know it’s a common question for all dog owners as it was one of my own. Do keep an eye out for it and you can ensure you don’t miss out by signing up to our email list below. Just one very final quick note that as with all of my blogs, I wasn’t asked to write about today’s course. I paid the full price of the course myself as part of running Millie’s Pet Services. However, having attended the course, I would recommend booking with Alder Holly themselves. Do get in touch with them by downloading their booking form. The next course in Forfar is likely to be in January or February 2017 and you can find a full list on their website (www.alderholly.co.uk). Millie’s Digest: Nearly 3 months old!